Summer maybe over but there are still loads of tomatoes to be eaten. Here are some of our favorite ways to cook and eat tomatoes. 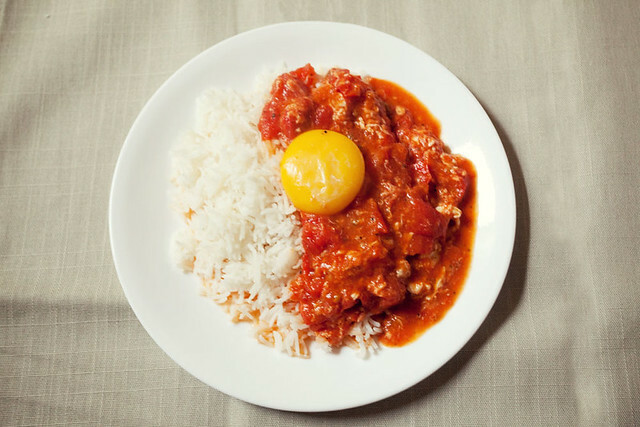 Tomato and egg over rice, a total comfort food meal. A quick and easy tomato sauce. Howard used canned tomatoes but fresh tomatoes should work just fine. And once you got your tomato sauce down, you can totally add other ingredients to it. For the tomato and capers with linguine, I used tomato paste but go ahead and substitute it with your freshly made tomato sauce. Howard cooks tomato and linguine his way. How about a tomato gratin dish? Tomato, eggplant and smoked mozzarella make a great side dish. And for the adventurous people, freeze your tomatoes and grate them over everything!